Here at Fit Small Business we know a thing or two about blogging. As a website that has increased its visits to over 800,000 visitors per month, we understand what it takes to get your blog off the ground. Starting a blog is a fun way to share your expertise on a particular subject with others. If done right, it can also be a substantial side or even full time business. In this guide, we’ll go through the steps of how to start a blog, from the initial setup, to actionable tips on how to grow your blog into a business. The first step in creating a blog is obvious, you need to determine what you want to write about. Although you probably already have a good idea of what you want your blog to be about, it’s important to be strategic about your content. 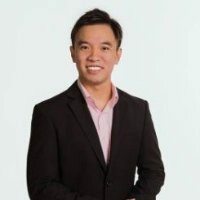 Ted Chong, who started his own successful blog, Digital Senior, offers this advice when considering what to blog about. You have to hone in on a niche that you can serve reasonably well. By doing so, you drastically cut down on your competition. People prefer something that meets their specific needs as opposed to a generic piece of content any time of the day. For example, Nerdfitness became a successful blog in a short period of time even though there were already countless fitness blogs, because it appealed to the specific target audience of nerds who want to be fit. Aside from having niche content, you also want to write about topics that people are commonly searching for. If your goal is to have your blog posts rank on the first page of the search engine results, then it’s important to research keywords to see how much search traffic different terms get, and how much competition there is for those terms. You can use Google’s Keyword Planner Tool to get this information (you will need to set up a Google AdWords account first). By writing articles around high traffic and low competition terms, you can increase the chances that your post will rank highly in Google’s search results. For more information on how to increase Google pagerank, view our guide. You don’t get your own custom domain name (ex: yourbusiness.com vs. yourwebsite.tumblr.com). This can lower your credibility as an authoritative blog. You won’t be able to fully monetize your blog. Free blogging sites have strict rules in place for when and how you can make money off of your blog. For example, you are not allowed to create blogs with the primary purpose of affiliate marketing (getting paid to promote products or services). This means that adding an affiliate link to multiple posts could be a red flag. 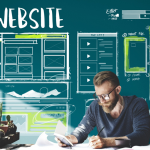 You don’t have full control over your website. If the website that is hosting your blog shuts down, your personal blog or the network associated with the blog will vanish as well. Similarly, if the blogging platform falls out of favor (ex: MySpace or Xanga), then you’ll have to start over on a newer, more popular site. You have design and HTML coding limitations on these types of sites. Therefore you won’t be able to make the blog look exactly how you envision. Go with this option if you are less serious about your blog, and just want a fun way to share your experience with others. We won’t be focusing on this option in this guide, but if you want to go this route, learn how to get started with a Tumblr blog. We recommend this option if you want a blog that you have full control over. Though this may seem like the more intimidating option, in this guide we will show you step-by-step how to easily get your blog setup on WordPress, the most popular (and free) content management system. The only cost involved is the cost to host your site, which you can get for as low as $2.95 with Bluehost. Plus, you will also get a free business email address (ex: yourname@yourblog.com) included with this plan. Setting up your blog with Bluehost takes less than 30 minutes, and then you can focus on the fun part– writing! If you are still reading this guide, it means you’ve decided to host your own blog. Therefore you will need to purchase a domain name (ex: yourblog.com). Bluehost includes a free domain name with the cost of hosting, so this will not be an additional charge. Descriptive of your blog – Ideally people will have an idea of what you are writing about simply from the name of your blog. For example, minimalistbaker.com is a food blog with recipes that have less than 10 ingredients. Includes keywords – You want people to find your blog when they are searching Google for answers related to your area of expertise. To increase the chances of this happening, include keywords that are related to your topic in your domain name. Easy to spell and pronounce – If you tell your friends about your blog, you want them to be able to go home and easily type in your domain name. If your website is hard to pronounce or spell, you’re making it harder for people to remember you. For more tips on choosing a domain name, view these 25 tips from the pros. Once you’ve landed on the domain name you want, you’ll still need to check and see if it’s available. After you have found the perfect domain name and made sure that it is still available, you can purchase your hosting plan. While you do need to choose the 36-month plan to get the best pricing, keep in mind that Bluehost does not require a commitment. You can cancel your plan at any time and receive a prorated refund. You can also switch between plans at any time and receive a refund / pay the difference. Now that you have your web hosting and domain name squared away, it’s time to create your blog. We highly recommend building your blog on WordPress, which is the most widely used content management system, powering 25% of the internet. Plus, it’s completely free. You will need to select your domain, change your password (from the computer generated option) and hit “Install”. Clicking this will bring up a page that shows your new login credentials. Note the Admin URL, which is where you’ll be going to set up, edit, and all-around manage your new website. Click on the admin URL and enter your username and password. If you can’t remember your login credentials, you can check the email from Bluehost that you received upon signup. 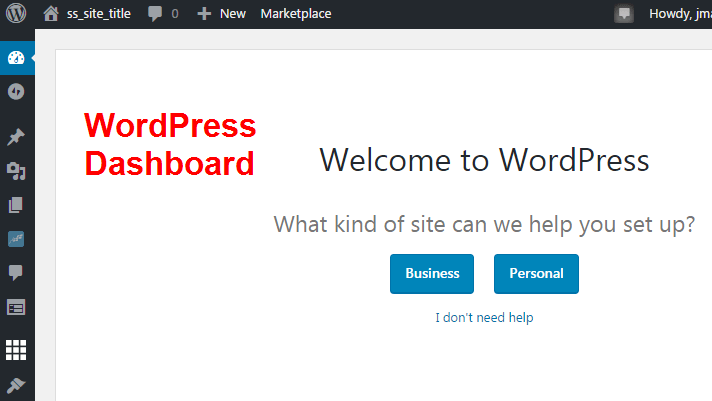 After you enter this information, you will see the dashboard of your new WordPress website. You have now downloaded your website! However, when you go to your URL, you will see this “Website Coming Soon” message. That’s because you still need to to download a WordPress theme and launch your website. WordPress themes modify the way your site is displayed. They are premade so that you just have to activate a theme to give your website a nice outward facing look. 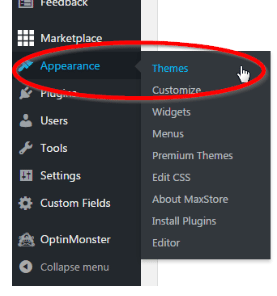 Go to the left side of the WordPress dashboard, and hit appearance and then themes. Unless you have a very specific design in mind for your blog, we suggest you use one of the pre-installed themes to start with. For our example, we are going to use the “Twenty Sixteen” theme. This theme was made by WordPress and is designed for blogging purposes. 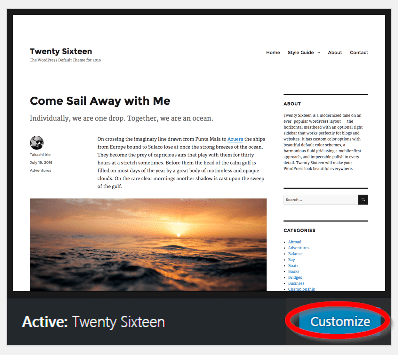 In order to activate the theme on your blog, hover over the theme and click the “Activate” and then “Customize” button. That’s it! You have just changed the entire design of your blog. 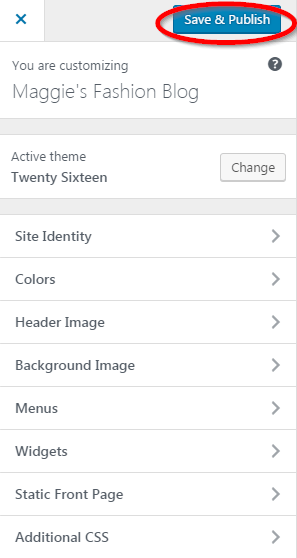 Once you’ve activated your theme, you will be able to make changes to how your site is displayed. This includes making changes to the images, colors, fonts and navigation. Below are the changes we made to our mock fashion blog using the “Twenty Sixteen” theme. If you want more customization options, our recommended premium theme is Divi from Elegant Themes. This theme costs $69 per year and makes it easier to create a blog specifically branded to your vision. After you’re happy with the changes, you can click “Save and Publish”. Don’t worry if everything isn’t perfect, you’ll be able to make additional changes after you have published your blog. You can also switch themes at any time. Possibly the hardest part about creating a successful blog is getting people to read it. You will need to effectively market your blog in order to get new eyes on your content. One of the best way to share your posts is through social media. Which social media network is best for marketing your blog depends on the audience you’re trying to reach (ex: Instagram has a younger audience, while LinkedIn draws a more professional crowd). View our guide to social networks to learn more. Another way to market your blog is by getting mentions on other, more authoritative websites. By using a free service called Help A Reporter Out (HARO), you can read queries from multiple journalists and submit your response through the system. If a reporter uses your response in their article, they will often mention you as the source, and sometimes even include a link to your blog. Read our article on How To Use Haro to learn more about this service. It’s not enough to get new visitors to your site. Once they’re there, you need a way to keep them coming back. Email marketing is a great way to do this. 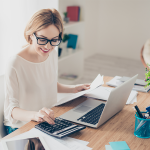 Bluehost’s plan includes a free business email address, so you’ll just need to set it up (view our guide to get started). This is an important step, since getting an email from yourname@yourblog.com will look more professional than getting an email from yourname@gmail.com. Create an ebook or PDF – Create an ebook or PDF with information that’s not included on your website. Have it so people need to enter their email address before they can download the information. Create a weekly newsletter – Give people a reason to give you their email address by sending out a weekly newsletter. You can have a pop up on your page to get people to sign up, or just a box at the top of your website that asks people to subscribe for weekly tips. By sending people weekly emails about new updates on your blog, you are giving them a reason to revisit your site. View our email marketing best practices to learn more. You should now have a good understanding of how to start a blog. If you’re passionate about a certain topic, starting a blog is a great way to share your knowledge with others who have similar interests. Plus, if you’re dedicated to the process, your blog can be more than just a hobby, and actually become a monetary business for you. Remember to check out Bluehost to get a domain, hosting, and even a business email for as low as $2.95 a month. Click here to check it out. Very nice and useful blog post. This blog is very helpful for beginners who are passionate for writing. Blogging is actually a great sharing of knowledge.